Refugees Welcome Haringey had a great time participating in this event, with the wonderful accompaniment of the Three Deuces! General Election 2017: find out which Haringey candidates support refugees! Today, Refugees Welcome Haringey is inviting all Haringey General Election 2017 candidates to pledge their support for refugees should they be elected to the forthcoming Parliament. We’ll be letting our supporters know about the responses we receive. 1. Will you commit to keeping the present Government’s pledge to resettle 20,000 Syrian refugees and 3,000 vulnerable children by 2020? 2. Will you commit to extend the current 20,000 pledge by another 8,000 for the life of the new Parliament (an additional 4,000 per year to 2022)? 3. Will you commit to re-establish the Dubs’ Amendment to help lone child refugees in Europe? 4. Will you commit to improve living conditions for asylum seekers and waiting times for asylum applications? 5. Will you commit to end indefinite detention and secretive deportation of migrants and refugees? Author refugeeswelcomeharingeyPosted on May 16, 2017 May 16, 2017 Tags General Election 2017Leave a comment on General Election 2017: find out which Haringey candidates support refugees! It’s more than three months since the announcement that ten Syrian refugee families would be resettled in Haringey, but so far none have arrived. Today we’re asking our supporters who live in Haringey to contact their councillors and the leader to ask what’s happening. Please also consider visiting your councillors to talk face-to-face in their next surgery. You can find contact and surgery details here. Feel free to use and adapt the template letter below! I am your constituent living in ward and like many people I have been deeply concerned about the terrible plight of Syrian refugees. I was delighted when the Council announced it would be resettling ten Syrian families in the borough through the Government’s Vulnerable Person Resettlement scheme. However, I am concerned that no further developments have subsequently been announced. I would like to know firstly when the ten Syrian refugee families are due to arrive in Haringey and secondly how the Council plans to implement these families’ resettlements, providing adequate and appropriate support for their needs. It is now several months since the Cabinet announcement of the resettlements on 15 November 2016 and I understand that several private landlords have already come forward to offer accommodation, some of which is about to become available. Can you tell me the expected timeframe for arrivals? I am also concerned that the resettlements will be implemented according to best practice once families arrive in Haringey. So far it remains unclear as to how the Council proposes to proceed and how the various statutory bodies, community, and voluntary sector will be engaged. 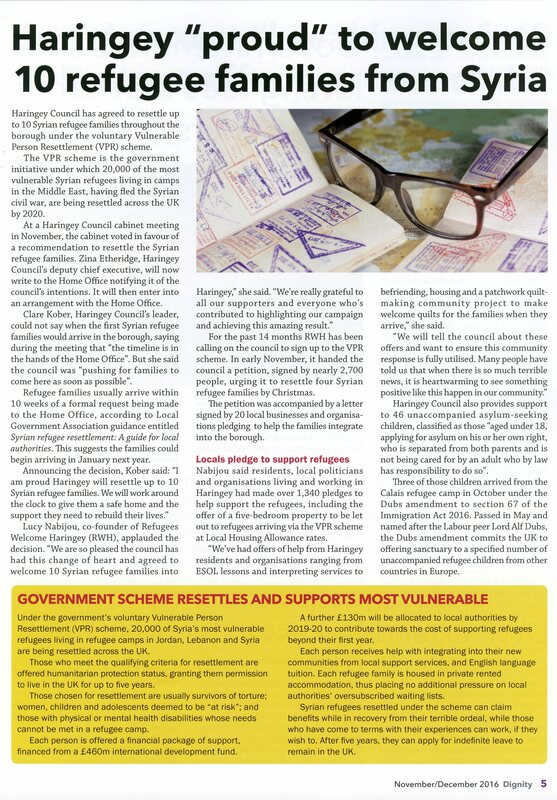 Other London boroughs have successfully adopted the ‘Lead Agency Model’, contracting out integration support to an expert provider such as Refugee Action or the Refugee Council rather than keeping this specialist work in-house. This is both because it is recognised that most local authorities lack capacity and expertise, and also that it is essential that refugees receive impartial advice and representation. Can you therefore tell me whether the Council intends to contract out integration support to an expert provider and if not, how it proposes to resettle these families in accordance with the best practice outlined above? I look forward to receiving your earliest response. Author refugeeswelcomeharingeyPosted on February 20, 2017 February 20, 2017 1 Comment on Contact your councillor today! “We’ve had offers of help from Haringey residents and organisations ranging from ESOL lessons and interpreting services to befriending, housing and a patchwork quilt-making community project to make welcome quilts for the families when they arrive”. -Arlene Martin, Dignity magazine, November/December 2016. Author refugeeswelcomeharingeyPosted on December 6, 2016 Format ImageLeave a comment on Properties Needed! Refugees Welcome Haringey Create a free website or blog at WordPress.com.